Construction of Wallbridge Lower Lock Channel continues apace. The post & mesh revetment and coir matting along the north (non-towpath) side of the channel is now complete. Abergavenny based ‘Alun Griffiths Construction’ team’s first task is to create a revetted navigable channel between Stroud Brewery Bridge and the derelict Wallbridge Lower Lock. The team will then install a dual purpose culvert… a) to carry excess water past the lock into the basin & channel below and b) to permit fish and eels migrating upstream. 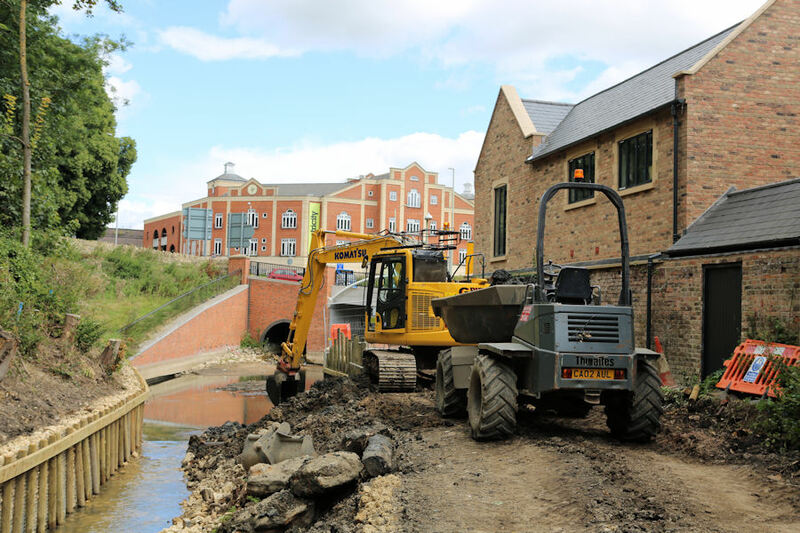 The navigation channel is being restored by working westward, from the gabions installed at the time of the construction of Stroud Brewery Bridge, towards the lock chamber. When the channel is complete the lock chamber will be restored by Cheltenham based Britannia Construction. The first picture shows the north side revetment now fitted with the timber fender along the top edge. The beginnings of the south side (towpath) side revetment can be seen in the foreground. The completed work now reveals the five metre width of the navigation channel. The second of Mike Gallagher’s pictures shows the narrowness of the work site as a large dump truck is filled with material from the old channel on this tight bend in the canal. The final image is the famous painting of Stroud exhibited in Stroud's Museum in the Park. The painting portrays the route of the Thames & Severn Canal through Stroud and demonstrates how the channel through Wallbridge has long been restricted by a tight bend. The painting dates from around 1790, at a time when wool was spun and woven into cloth in the small cottages where people lived. These were the days before large machinery was housed in huge mills such as Ebley. The Thames & Severn Canal opened in 1789 and was a continuation of the Stroudwater Navigation which was completed in 1779 and terminated at Wallbridge Basin. The unknown artist would have been sitting in fields along what is now Cainscross Road, somewhere close to Homebase. 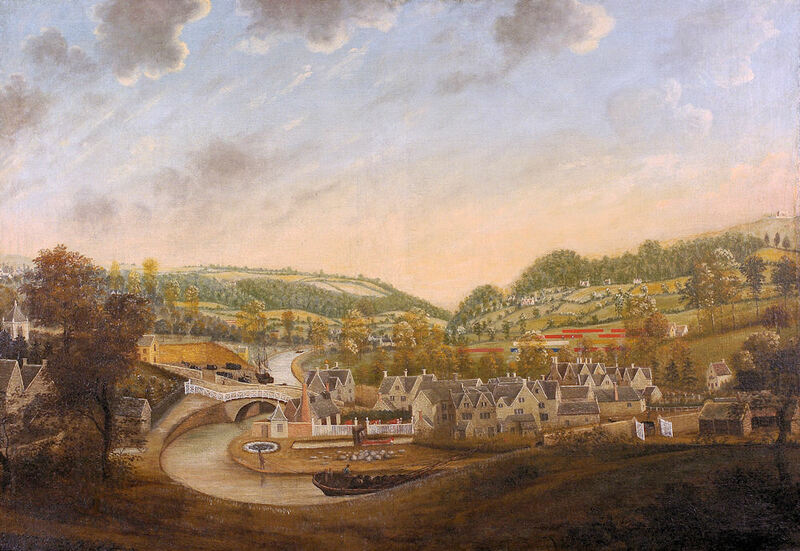 Painting reproduced by kind permission of Stroud District (Cowle) Museum Trust.